The crown jewel of The School of Art is a complex of 5 galleries around a central courtyard. Each week during the semester graduate and undergraduate students show new work. It totals up to about 120 student exhibitions a year. All 5 galleries and the courtyard are wonderful exhibition spaces. Yet there’s something special about the smallest gallery: The Merlino Gallery. The Merlino is small. With a 235 sq. ft. footprint (23.5′ x 10′) it is 1/2 the size of the next smallest gallery, and 1/6 the size of the largest. It is also the most rectangular, or most “widescreen”, also by a lot. The footprint aspect ratios of the other galleries range between 1.08:1 and 1.85:1. Serendipitously enough, the Merlino footprint is exactly the CinemaScope (Panavision) aspect ratio of 2.35:1. In movie theaters CinemaScope ushered in a new era of cinematic immersion, and at LBSU’s Merlino Gallery, the narrow entrance unfolds into deep spatial experience. Maxine Merlino worked on some Preston Sturges films, but I believe this was before 1950, and CinemaScope didn’t arrive in movie theaters until after 1950 (as a way to combat the rise of television). I believe the Sturges films were shot in Academy Aspect Ratio of 1.33:1. Therefore, the Merlino Gallery represents the first time that the effervescent Maxine Merlino has worked in widescreen. The small size and CinemaScope aspect ratio of the Merlino Gallery seem to make it the site-specific installation gallery. I’ve seen many remarkable exhibitions here. And, I’ve always thought I should start a collection of Merlino shows. At last, here is that collection. 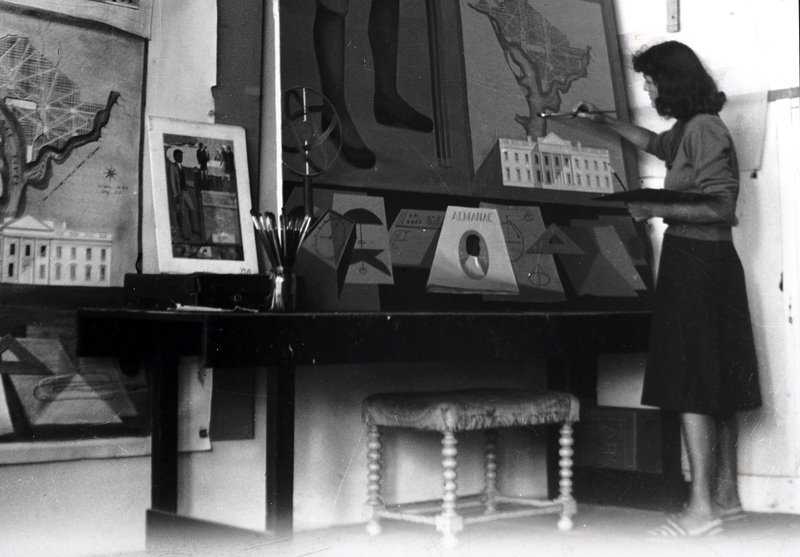 Maxine Seelbinder Merlino at work, 1943 / unidentified photographer. Maxine Seelbinder Merlino papers, 1928-2003. Archives of American Art, Smithsonian Institution. “Maxine Ollie Seelbinder Merlino was born in Portland, Oregon in 1912. She trained at the Portland Art Museum School before venturing to New York City where she took classes at the Art Students’ League. Merlino worked in New York from 1936 to 1943 as a free-lance illustrator, muralist, and theatrical set designer. “In 1940 and 1942, Merlino won mural commissions for the United States Department of Interior Section of Fine Arts program. She designed and executed murals for the S.S. Garfield, and painted a mural that graced the Recorder of Deeds Building in Washington, D.C., one of seven murals in the building celebrating the contributions of African Americans. “Merlino received her bachelor of fine arts degree in 1950, placing her in the first graduating class of CSULB. She followed that up with a master’s in fine arts degree in 1952 and doctorate in education from USC in 1962. During the course of her tenure at CSULB, Merlino taught both drawing and painting, as well as set design for theatre. She eventually became dean of the School of Fine Arts and retired in 1976. “Personal accomplishments included climbing to the summit of several of the world’s highest mountains. Following her retirement, Merlino was inducted into the Master Swimmers Hall of Fame, with several first place finishes well into her ninties. In 2003, CSULB named one of its art galleries—the Dr. Maxine Merlino Gallery—in honor of her.” She passed away in 2013 at the age of 101. 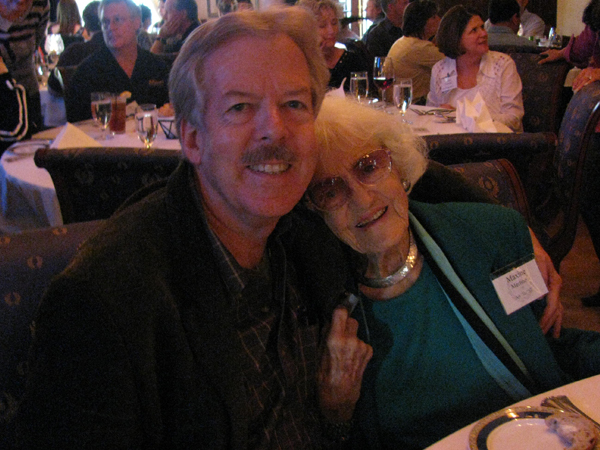 Tony Baxter, Theatre Design, CSULB ’61 and Maxine Merlino, Art, CSULB ’50 & ’52, at Club 33 at Disneyland. 25 March 2009. Merlino introduced Baxter who was speaking that evening. Is Merlino Gallery a Place? Of course, Merlino Gallery is a place! This place is the reason this collection of exhibitions exists. And yet, as I think more deeply about it, perhaps Merlino Gallery is less of a place, and more of an affordance. 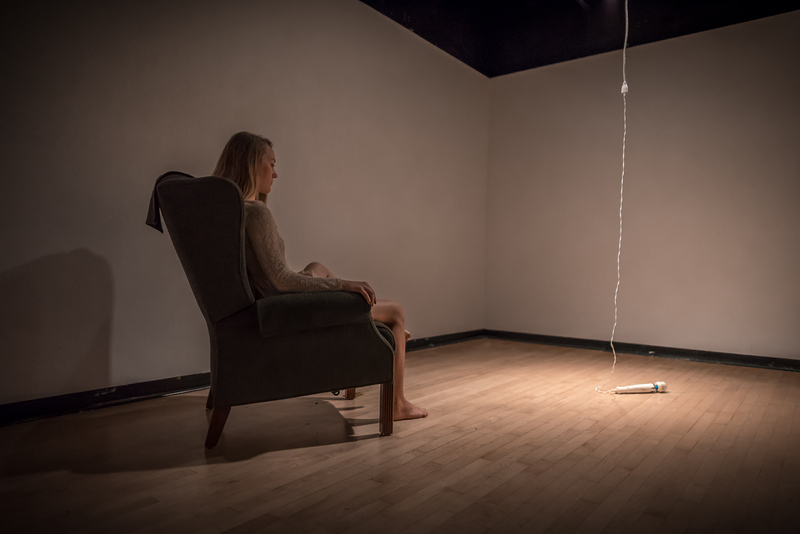 Today I was sitting in a far corner of Merlino Gallery, taking the time to experience Megan Macuen’s installation I Know Your Habits, But Wouldn’t Recognize You Yet. As I drifted into Macuen’s space, it occurred to me that this was the same piece of floor I’d sat on a month ago to experience Cortnee Brush’s performance Onanist. Brush’s performance was deeply present in this space a month ago. But today was not a palimpsestic experience of Macuen layered over Brush. Today was largely the experience of Macuen’s installation. Yes, I can mentally step back and appreciate the profoundly palimpsestic nature of Merlino Gallery. But this is a meta experience. Like a gracious host, Merlino doesn’t talk too much about the amazing guests who have previously dined here, she affords each diner their own special meal. This collection exists because of the palimpsestic quality of Merlino Gallery. But on any given day she is happy to retreat into the background and afford each exhibiting artist a day of their own. Merlino Gallery by Glenn Zucman is licensed under a Creative Commons Attribution 4.0 International License. Permissions beyond the scope of this license may be available at glenn.zucman.com. This license applies to the words & images on this site by Glenn Zucman. The artists represented here each own their own copyrights to their work. Please consult them directly if you are interested in using their work. Where available, I’ve included the artist’s Web URL & Instagram at the top of the post. If you need further help in contacting artists, you can use my contact form. Like many students, faculty, staff, and others from the Long Beach State University community and beyond, I often visit the School of Art galleries. My special fondness for the Maxine Merlino gallery has motivated me to document some of the exhibitions there. The content of this site represents only my own ideas. I do not represent the School of Art, the College of the Arts, Long Beach State University, nor the exhibiting artists. Thank you, Dr. Maxine Merlino! Thank you to all the artists exhibiting in Merlino Gallery. And, Thank You, for visiting.